We here at Perspectx recently had the opportunity to do some work for the Troika in Hollywood California. These guys manage a lot of major brands like ESPN and ABC and they brought us on board to help facilitate their work for the HUB cable network. As I understood things we got this opportunity because they were looking for a bit more competitive bids than what they were getting out there in LA and one of their animators who used to freelance with us pointed the company in our direction. Let it be known that SLC can hang. 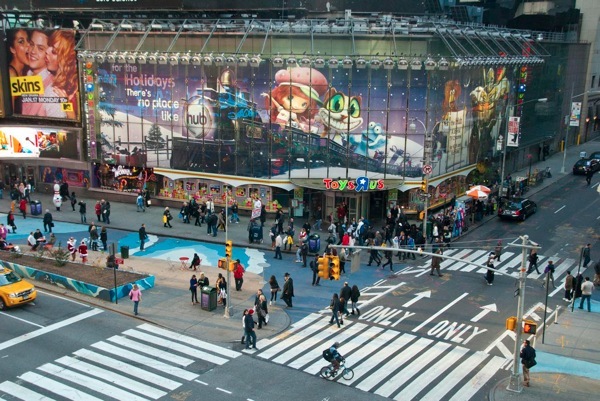 The project started with us helping develop a billboard that was going to go over the Toys ‘R Us store in Times Square. Troika provided all of the Art direction and final compositing as we developed the models, scene set up, lighting and rendering. 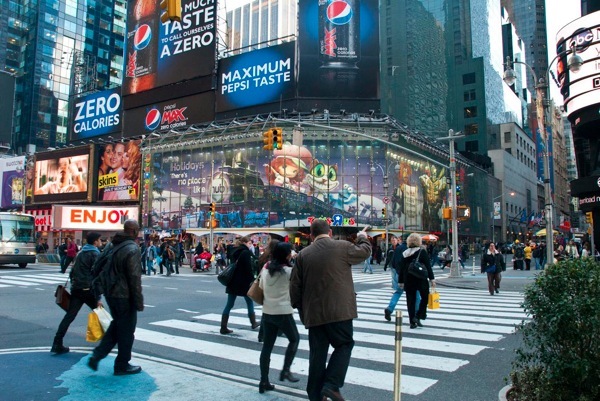 When the majority of one’s projects don’t exist outside of the corporate world it’s extremely exciting and rewarding to have a picture snapped of your companies work being displayed in Times Square NYC! Then followed work on very short holiday interstitial animation. This process was extremely fun for us because of the requisite high quality, coupled with the technical challenges that confronted us to pull it off. Again, we worked closely under the direction of Troika’s Art Director and Producer assigned to this project. This work flow included storyboards, animatics, character sheets and color comps coupled with detailed phone conferencing to help insure that we stayed on point with their vision. The main challenge on our end was creating the Christmas tree that all of the little “hublets” land on that fit with their vision. In fact it may have actually been this challenge that made the other LA companies balk at this project (the author’s speculation only). After a disappointing first attempt at the tree we realized that in order to pull it off properly some serious R and D had to be done. We determined that a fur system was about the only way to get the realism that was required for the shot. So that tree had over a million individual needles in the pulled back shot. Then came the challenge of creating realistic snow. 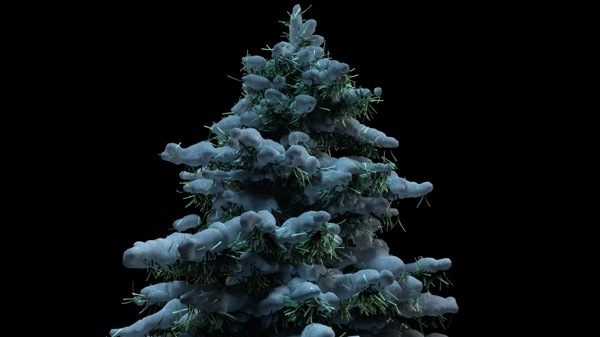 We ended up “growing” the snow from the branches using a particle system and then taking it in to Zbrush to touch things up (basically to give it a bit more volume- the particle system worked remarkably well). The shader for the snow was one of the more advanced one’s we had ever built. It involved using some mental ray SSS (sub surface scattering) and about 12 other nodes to get that magical sparkly-ness that any self respecting snow shader would have. 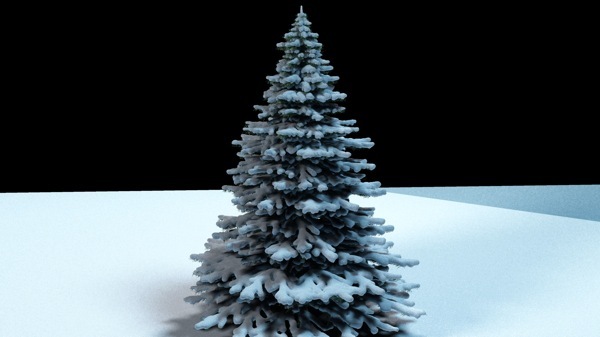 The next challenge was to rig the tree appropriately for each shot (the close up, tree top and far away) and insure that the fur system and snow all deformed properly when the rig was animated. The tree top needed to have a cartoony feel for when the HUB logo came and landed on it so we thought the best way to get that was a little old fashion squash and stretch functionality. Not too big of deal except that string of lights needed to deform with the tree top as it was squashed. The solution there were IKspline rigs constrained to tree branches so as it deformed the lights would bend and twist convincingly. So this tree was handed over to their animators they made their magic happen we brought that animation over to be lit and rendered and then we spit back those files for them to composite. Since we knew that they had a very particular sense for color and design we pretty much gave every scene element alpha channels so that they could be individually tweaked if they so desired. The second animation was to introduce the HUB family movie night. This animation brought a host of new challenges for our team. The workflow was the same where we were given detailed animatics and instruction for us to developed the sets, rigs for the animation, and lighting and rendering set ups. The fur on the spartan plume was a fur system that was controlled dynamically by a hair system. Along with remodeling the overall contour of the spartan HUB to give him a seamless helm look. 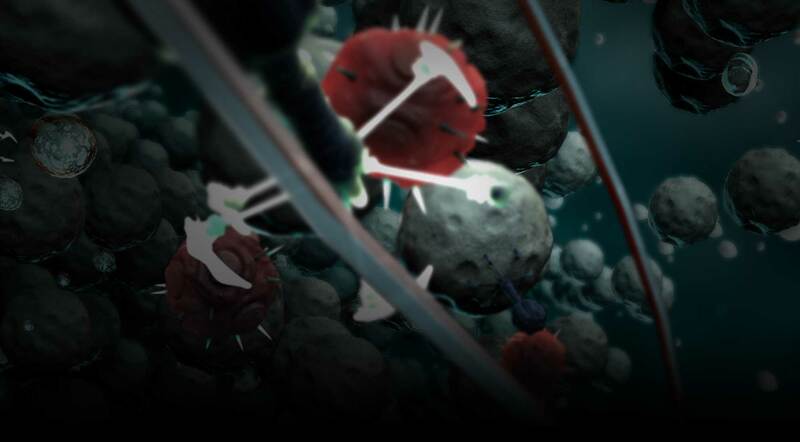 Which proved rather difficult because the team that created the HUB character had built a very advanced shader and had a unique painted weights system that was proving very difficult to work around as we invariable lost both of those features modifying the mesh like we did. We ultimately used a wrap deformer that referenced the original mesh to deform this new mesh and reversed engineered the shader to make it work for this new model- quick thinking Rex! The film strip getting reeled into the HUB we ended up animating on our end because the nature of the rig was so complex and messy it was easier and faster to just keep it on our side of the fence rather than walking someone through how to use it. It took several animation attempts and scrapping of the rig before we got something that fit with the animatic and the art director’s vision. The whole experience with Troika was remarkably refreshing for our team and gave us a new level of confidence that we can rise to any challenge put in front of us. We are excited to solicit more work of this nature in the future- it’s just way too much fun to stay away from! This is 15min tutorial on how to use Maya’s dynamic hair systems to deform your geometry. This is a great way to get fast realistic deformation that would be extremely difficult to obtain with key framed animation. Enjoy!